Place : Catbells, Cumbria. Uk.. 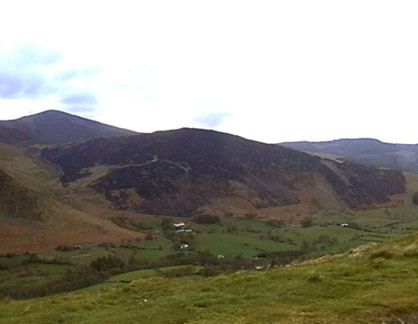 Distance and time : 2.7 mls with 1200 ft of ascent on Catbells. 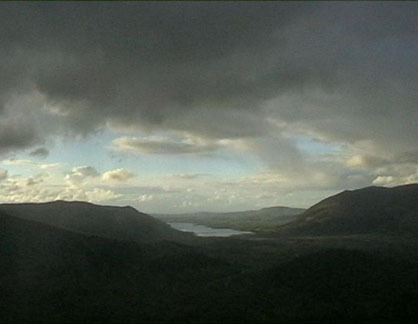 Weather : A fine but breezy afternoon, with a flurry of showers later, carried in on the westerly breeze. a works contribution to the Lakes Tourism Partnership. Our start point was Manesty woods, a mature woodland half way along on the western side of Derwent water. 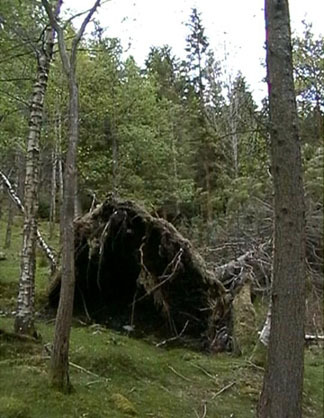 Several old trees had fallen over the years leaving impressive root clusters open to the elements. 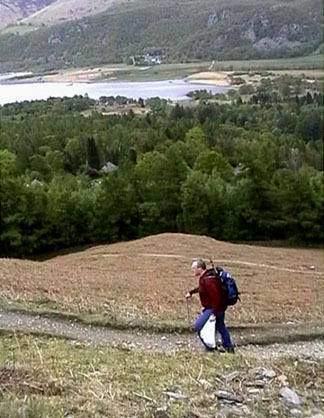 Phil, white bag and picker in hand checks out the Manesty path. Michael (the boss) finding half a bag full already. 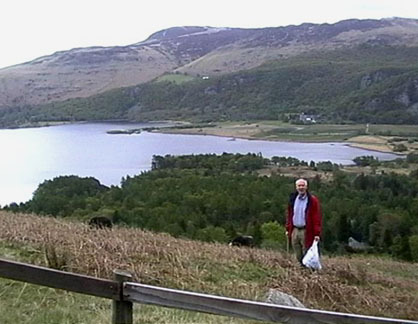 Behind are views of Bleaberry Fell and the Lodore Hotel. The summit ridge gained, we had a view of Barrow, black after the recent fire. 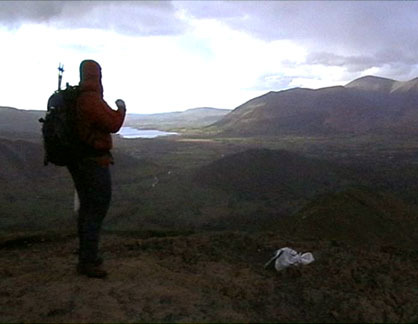 Catbells Summit, and a rain shower brings the gortex into use. Dark clouds over Bass Lake. Osprey country. 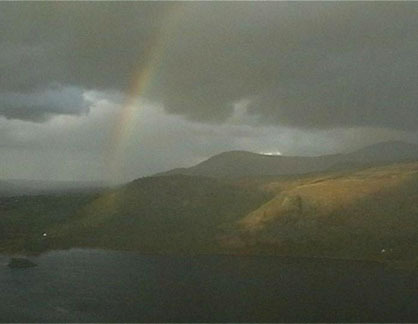 But a rainbow follows the rain, shining down over Walla Crag . 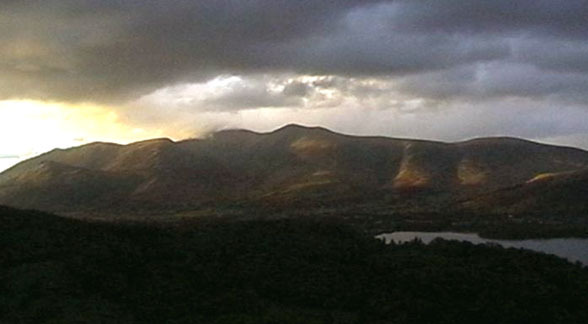 . .
and leaving us with dramatic evening light on the Skiddaw range. A job well done. 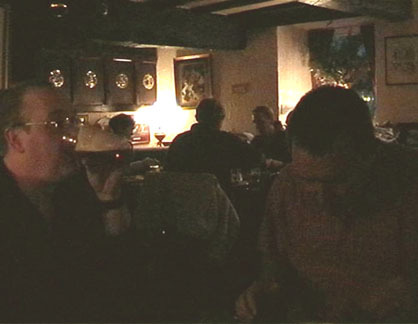 19 carrier bags of rubbish later, we all re-group at the Swinside for supper. Post-script: The rubbish include the expected cans, drink containers, sweet wrappers and tissues galore. The most ridiculous items, of which there were many, were carefully tied bags of dog mess near the start. Clear them off the path - yes please - but leave the contents to bio-degrade out of the way in the undergrowth, or take them home. Carefully wrapping them in plastic and then dumping them means they will never degrade, and will be litter ever more until someone else has to pick them up !! !